The love stories are always the most exciting ones, and now you get to take part in this one that takes places in a very dark environment. As they say, love conquers all, so you must not let the challenging terrain keep you from reuniting this lovely couple. Switch back and forth between them and make sure you dont hit the spikes with either one of them. 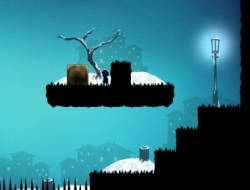 Move boxes to reach higher grounds, but make sure you do not jump from too high with any of the two characters or they will fall to their death. Try to figure out where to go with each character so they can see each other once again, even though the faiths are against them. If you manage to make the boy and girl meet you will advance to a more challenging level, but nevertheless a more rewarding one. Use the arrow keys to move and Z to switch between the two characters. One and One Story 10.00 between 0 and 10 based on 1 votes.